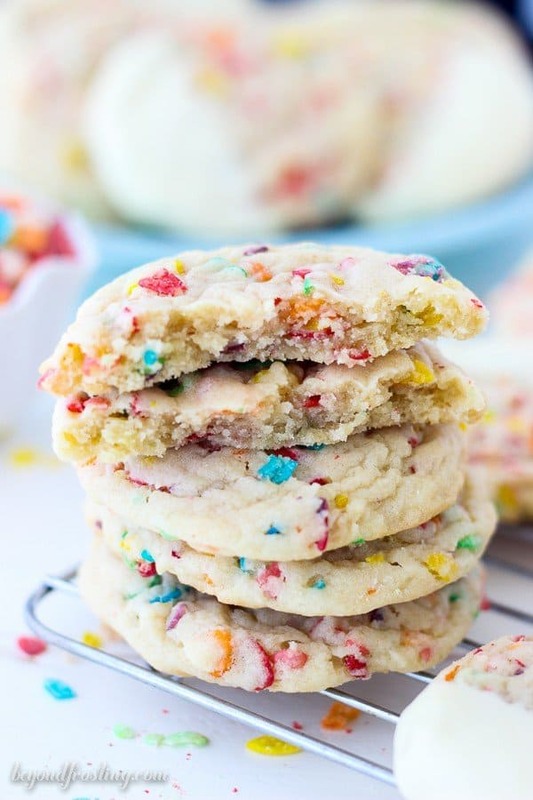 These super fun Fruity Pebbles Cookies are a soft-baked sugar cookie stuffed with fruity pebbles and dipped in white chocolate. A couple of weeks ago I picked up a box a Fruity Pebbles and headed back to the kitchen. All the sudden I felt the urge to make #allthethings with Fruity Pebbles. Lucky for you, I did that. But you’ll have to wait and see what else is in store. 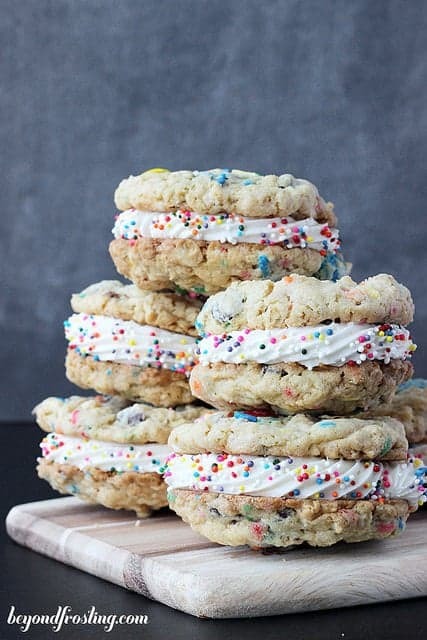 First up, I’ve giving you these Fruity Pebble Cookies. 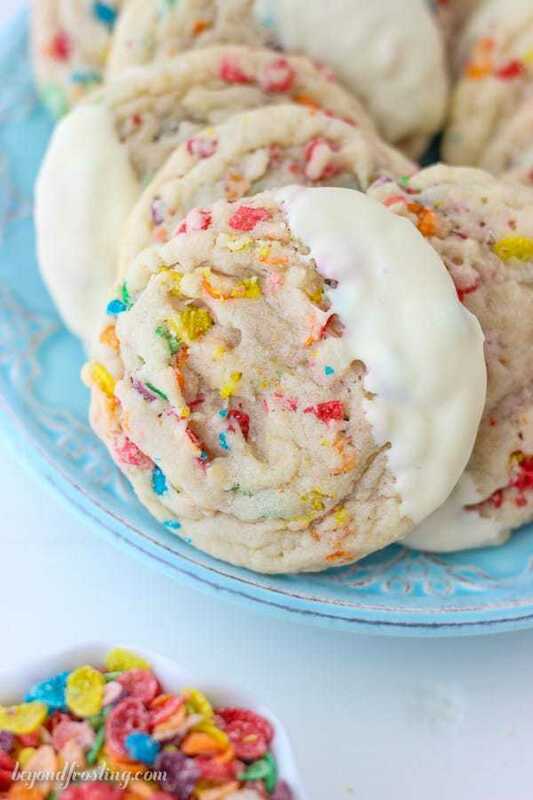 These fun sugar cookies are LOADED with Fruity Pebbles! 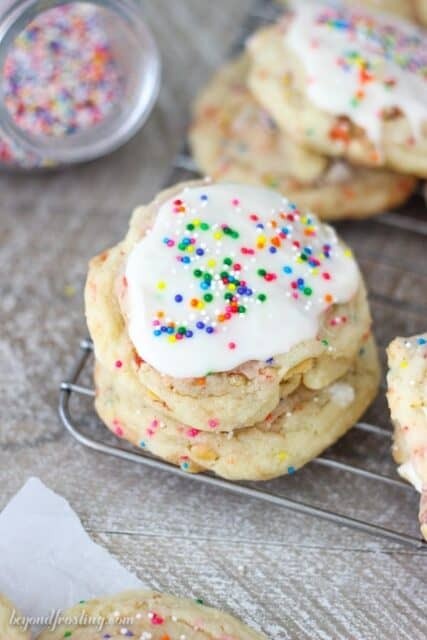 You can even dip half of the cookies in white chocolate if you want. 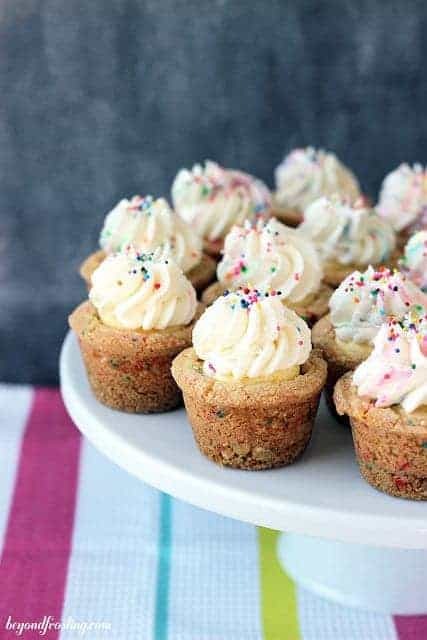 The cereal itself softens a bit when it is baked, but you are still left with the hint of the sweet Fruity Pebbles in every bite. 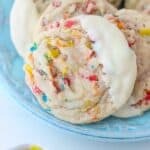 I’ve used my favorite base cookie recipe from my Perfect Snickerdoodles but it’s also the same base that I’ve used in a number of my cookie recipes. I love this base recipe because it’s buttery and sugary and the recipe includes a little bit of cream of tartar. 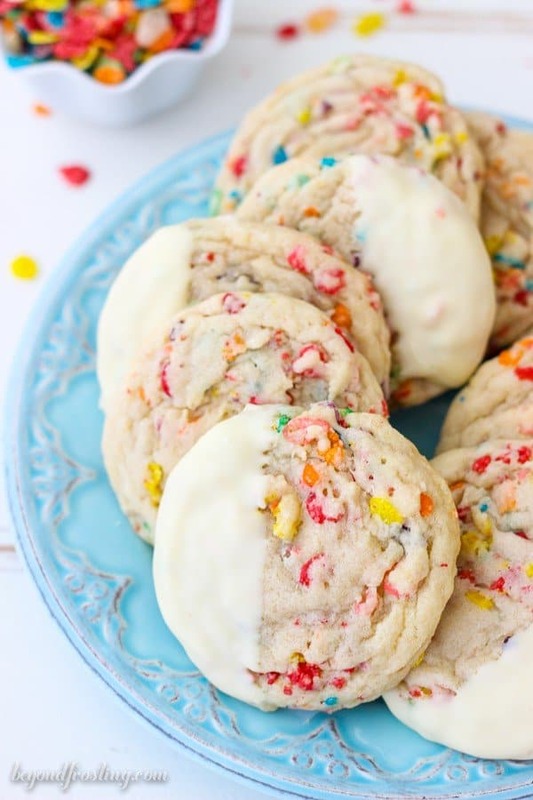 The cream of tartar is just one of the few reasons these cookies stay soft. When I bake my cookies, I always pull them out of the oven when they are still slightly under baked. I leave them on the baking sheet for a few minutes so they can continue to bake while they cool. After these have completely set, you can break them apart and they are absolutely perfect in the middle! That’s my kind of cookie. This cookie dough does require a bit of resting time in the refrigerator. You absolutely can’t skip this step. If you do, your cookies will be flat like a pancake, and I just can’t stand a flat cookie. 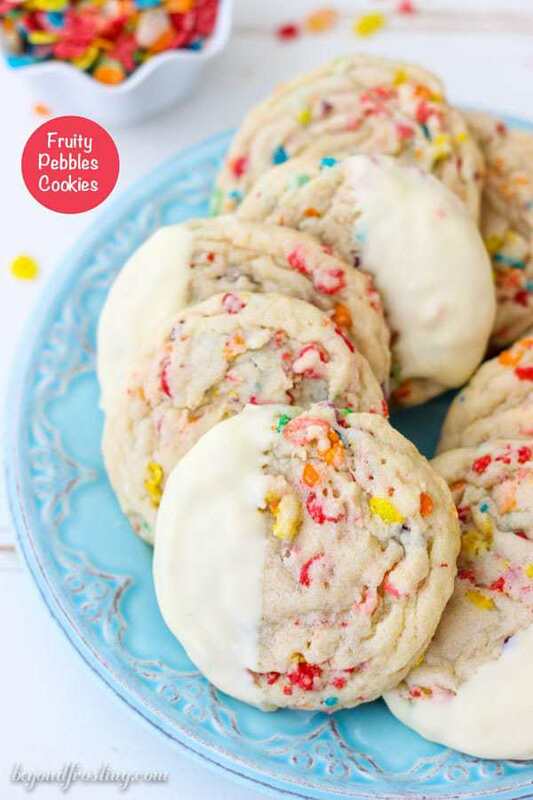 You probably wouldn’t buy a box of Fruity Pebbles and think about putting them in some cookie dough, but that’s why I’m here to help you think outside the box. No pun intended. Okay, maybe some pun intended. If you decided to dip these in some white chocolate, I suggest to buy high quality candy dipping chocolate such as Baker’s Brand or Ghirardelli. I always break the chocolate up into smaller pieces and microwave it at 50% power for 30 seconds at a time. I stir it after each 30 seconds so that it doesn’t burn. Then dip your cooled cookie in the chocolate and tap off the excess chocolate on the side of the bowl. I will usually set these down on some parchment paper and let the chocolate harden completely. Sometimes if I don’t have a lot of time, I will set the cookies on a baking sheet and pop it in the refrigerator. That’s it folks! 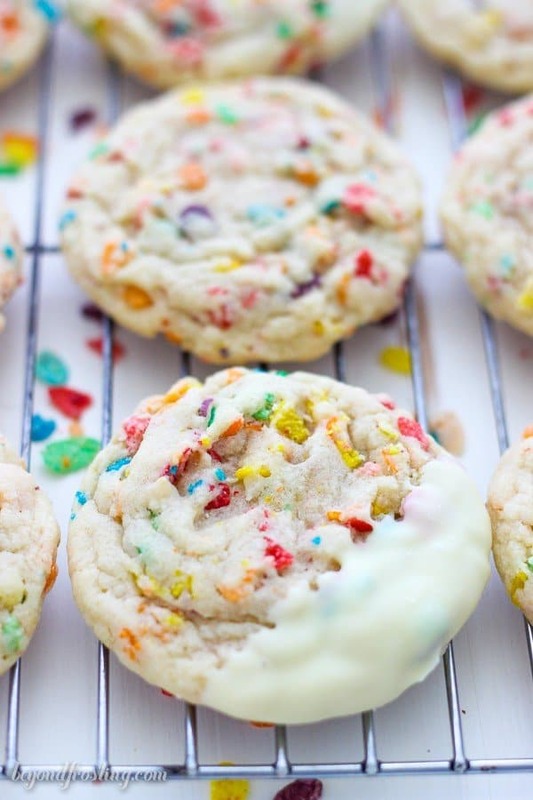 Just a handful of simple ingredients in these fun Fruity Pebbles Cookies! Mix in Fruit Pebbles with a spatula or with your mixing speed on low so they do not crushed. Refrigerate the dough for a minimum of 30 minutes, but the longer the better. Preheat the oven to 350° F. Use a large cookie scoop (3 tbsp) and scoop cookie dough onto a parchment paper lined baking sheet. Place about 2 inches apart. To coat with white chocolate, break the chocolate up into smaller pieces and microwave it at 50% power for 30 seconds at a time. Stir the chocolate after each 30 seconds so that it doesn’t burn. Then dip your cooled cookie in the chocolate and tap off the excess chocolate on the side of the bowl. Set these on a piece of parchment paper to cool. Hi! I made these the other day and I thought they were super yummy. I was thinking about adding some almond extract to the next batch as I wanted a little more flavor. What do you think? And what amount do you think would be good to add? Thank you so much! Hi Cassie! That’s awesome! Yes definitely, Almond extract would work just fine! You could do a couple things. You could do half vanilla, half almond. Or just replace the vanilla with almond extract for a stronger flavor. Enjoy!